This study suggests that resting blood pressure (BP) reflects arterial catecholamine levels not only in the high BP range but also among subjects with normal BP. Moreover, cardiovascular and catecholamine reactivity to mental stress seems to be a marker of resting BP, indicating that subjects with higher BP may be more vulnerable to daily stress. The associations in this study were found in subjects unaware of their BP status, indicating other explanations than mere awareness behind the sympathoadrenal activation seen in young borderline hypertensives. Catecholamines during mental stress contributed substantially and significantly to the prediction of future systolic BP independently of other well-known predictors. This is the first study showing that sympathetic nervous activity during mental stress predicts future BP, indicating a possible role in the development of essential hypertension independent of initial BP. 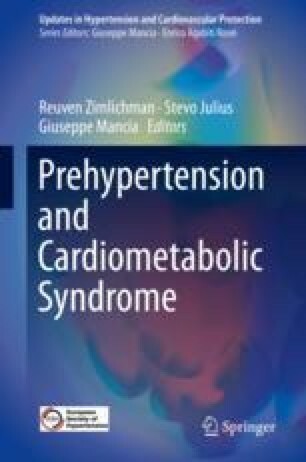 The early stage of hypertension development characterized by a β-adrenergic hyperkinetic circulation with increased cardiac output may explain why reactivity to the mental stress (predominated by β-adrenergic responses) is a better predictor than the cold pressor test in young subjects. Adrenaline response to mental stress was a negative predictor of future BMI, waist circumference, and triceps skinfold thickness after 18 years. These relationships were not found during the cold pressor test. As mental stress induces a more pronounced adrenaline release compared to the cold pressor test and exerts its effects mainly through activation of β-adrenergic receptors, these findings are in accordance with the growing amount of evidence indicating that reduced stimulation of β-receptors plays an important role in the development of obesity. The noradrenaline response to the cold pressor test predicted fasting plasma glucose and HOMA-IR after 18 years’ follow-up. The association with HOMA-IR remained significant after adjusting for other risk factors. The superiority of the cold pressor test over the mental stress test may be explained by the cold pressor test’s ability to test α-adrenergic responses which reduce blood flow to skeletal muscles, indicating that insulin resistance may develop more readily in subjects liable to increased vasoconstriction. This chapter is based on the PhD thesis that Arnljot Flaa, MD, defended at the University of Oslo in 2009. Though shortened the structure of the thesis has been maintained. Conflict of interest: S.E. Kjeldsen reports modest honoraria from ABDiiBRAHiM, Bayer, MSD and Takeda. The other authors report no conflicts.